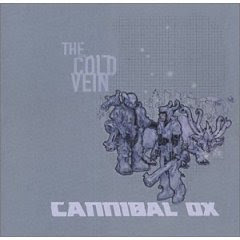 The Cold Vein is the best east coast rap record to come out in the last decade. I have no idea why I haven't gotten around to uploading this one yet. EL-P does the production on this album, and it's easily his finest work. There really isn't a single weak beat to be found here. This album also happens to have some of the strangest universal appeal I have ever witnessed. You could play a Cannibal Ox song for damn near any music enthusiast-- rap fan or otherwise, and they'll enjoy it. Unfortunately these guys called it quits shortly after this record was released. "Unfortunately these guys called it quits shortly after this record was released." These guys just recently got back together, last January. Pretty awesome, if you ask me. this album is classic. one of my personal favorites.